The ants, in the Copor Esurit installation came from a commercial ant farm supplier. 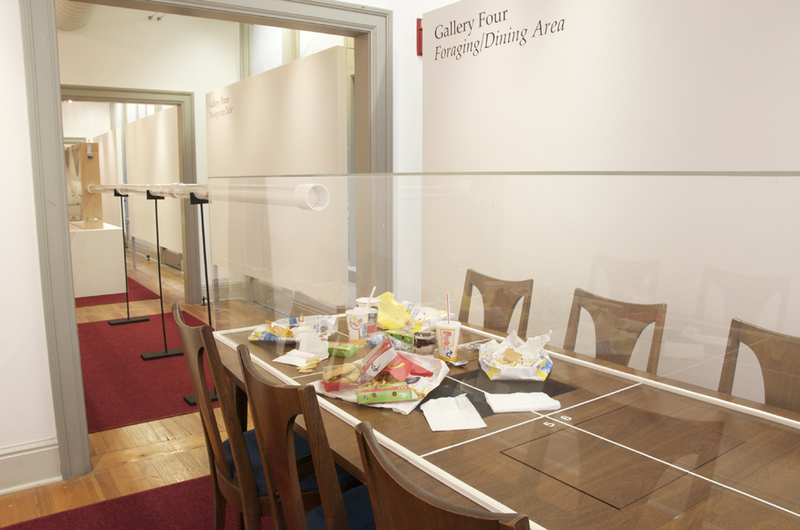 During the exhibition they tunneled, foraged and made good food choices. The life span of the ants in the installation’s habitat was carefully measured and was, on average, longer than that of ants in a commercial ant farm. Below is a good overview of “Copor Esurit, or we all need a break today” from the Journal of Environmental Studies and Sciences. The project description is the second one down. I’ve also included some of the article’s conclusion which talks about the NY Times review of the project, mentioned in my last post, under the section on media. I article below details four art projects that I have authored in which science was an integral component and additionally addresses the challenges and rewards inherent in soliciting institutional support, dealing with the media and presenting work in this genre of art making. As an artist, one of the things that I see in the current state of scientific research is that the study of emergent properties, in areas such as genomic engineering, AI and computer science, finds the scientists of today functioning in an applied fashion. In these fields, researchers make something and then watch to see what it does, which is similar to the way that many artists create artwork. This, coupled with a recognition of the role that the arts play in innovation, seems to have made scientists and scientific institutions increasingly receptive to working with artists. My goal, in presenting artwork in this publication, is illustrate this trend. I used to think that human industry was the greatest threat to the continuation of life on Earth, as we know it. I now both believe and fear that it is our primary hope. The first piece I am going to share is titled The Hand Up Project: attempting to meet the new needs of natural life forms. It is dedicated to land hermit crabs, these are the small crabs with thin exoskeletons that must adopt the abandoned shells from marine gastropods in order to remain housed and protected from predators. The problem is that, right now, there are not enough shells left on global shorelines for this animal to use—so biologists routinely find them living in broken glass jars, plastic bottle tops and any other form of refuge that they can get their pincers on. The second project is titled Corpor Esurit, or we all deserve a break today (Copor Esurit is a derivation of a Latin phrase meaning the body hungers). This piece offers a population of ants fast food from McDonald’s for the duration of one month, and considers the impact of the industural food sources on us humans as well as the many other species that, by extension, may also end up being dependent upon modern food production for sustenance. Nesting part of Copor Esurit habitat. Enclosure is climate controlled and offers vermiculite and other natural materials for tunneling. Visitors to Corpor Esurit were encouraged to participate in observing the ant’s foraging behavior by drawing diagrams and filling out observational questionnaires in the gallery. These questionnaires helped to identify what foods the ants preferred, and the extent of their foraging behavior. The questioneers also asked viewers to describe their own consumption of junk food. In addressing industrial food production, the interconnected nature of our food chain, and the plight of life all forms facing changing food sources, wall-size menus were posted in the gallery listing the constituents of each human food item offered. Spanning 20 feet in its installation at CEPA, the exhibition was built at eye height to facilitate first-hand observation of an animal that is rarely seen at an intimate distance. Part of the foraging area is shown here. The third project is titled Listening Stations for Birds, That Play Human Music. A collaboration between the artist James Walsh and myself, it considers the fact that although birds are bombarded by human noise on a routine basis, and many species respond to human song, nobody has ever studied what type of human music birds might prefer. The last artwork I am going to describe is titled Lichen for Skyscrapers Project. This project seeks to ameliorate the lack of native vegetation found in global cities by culturing lichen on the sides of skyscrapers and other manmade structures. Lichen, a wonderfully adaptable life form, can grow vertically on many porous surfaces. Once propagated, it forms a protective barrier, insulating its supporting surface from harmful elements while serving to lower the cumulative temperatures and rain runoff in metropolitan centers. This, along with the ability to withstand extreme drought, makes lichen an almost ideal form of “houseplant”. 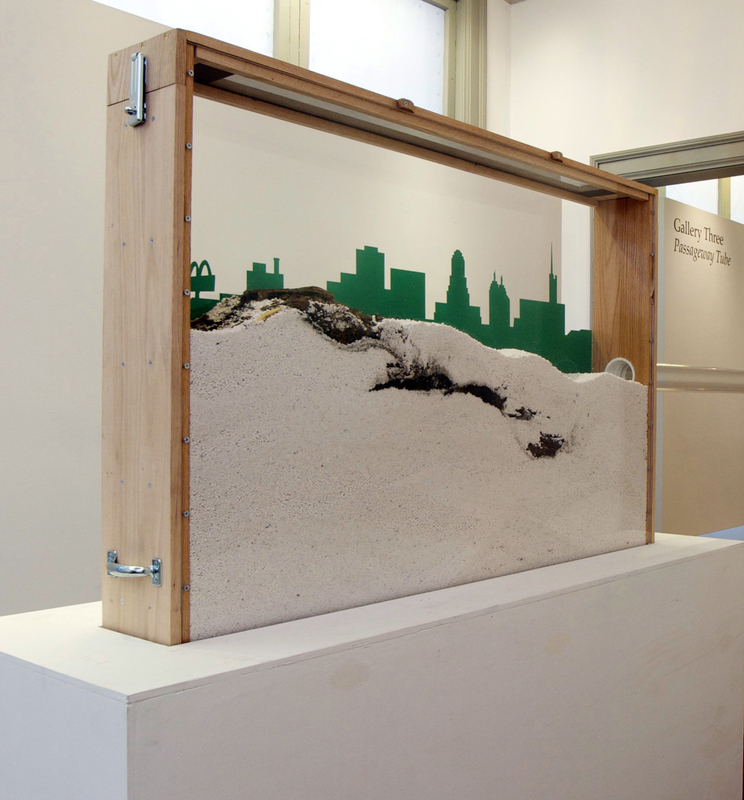 This artwork was originally exhibited as part of New York City’s Art in Odd Places Festival in 2011, which was dedicated to the concept of ritual. As part of this festival, Lichen for Skyscrapers proposed lichen planting as a new ritual for the urban dweller–one that seeks to renew nature in an inner-city context. One of the challenges I have found in soliciting institutional support for this work is that, with these pieces, I am interested in simultaneously presenting contradictory qualities. As an artist, it is my aim to present hope, despair and humor all at the same time—being that these pieces often point to the ecologically disastrous but still hopeful point of human production. These artworks may also, in turn, critique institutions, the scientific method, capitalism, design and even human innovation. In 2007 I presented the Hand up Project to a gathering of scientists and CEO’s from a high-tech global corporation, at a symposium on art and technology. During my presentation on the plight of homeless hermit crabs there was not a dry eye in the house. The higher-ups at the company immediately solicited project information on the artwork, with the intention of possibly funding the dwellings. At the time, the companies current add campaign was “Innovation That Matters,” which seemed inline with the goal of the project. Unfortunately, I was compelled to submit to the company a well-known article on the project that I had authored for the journal Cabinet Magazine, which confirmed that the corporate logo on each home was indeed a critique of global capitalism. The article also included the fact that I had originally based my designs for the fabricated dwellings on the work of the famous fascist architect Giuseppe Terragni. I had done this during the projects inception because, at the time, I had been thinking a lot about how fascism was at its core an example of inappropriate care giving—which in spirit seemed to me to mirror our own cultural interactions with nature. Needless to say, that additional information doomed the projects chance of being sponsored by the corporation. Art is a powerful way to bring science and the work of individual scientist’s to a wider audience because this genre of work carries the possibility of generating lots and lots of media coverage. The Cabinet Magazine article that was mentioned above, initiated numerous interviews on the Hand Up Project and led to the artwork being detailed in an essay by Bonnie Rought, that was chosen for Houghton Mifflin’s 2007 Best Science Writing compendium. On the other hand, Corpor Esurit was profiled on the front page of the New York Times Science Section, which was thrilling. However, the first time contributor to the Times, who wrote the article, didn’t seem to know how to approach writing about art or science, and did not include basic information provided in the installation’s didactics. Instead the writer got the species of ants used in the project wrong, and then went on to question three entomologists, none of whom were familiar with the installation, about whether or not the correct species of ant was used, wholly neglecting any mention of industrial food production or the intent of the piece (see the previous post for the letter that was sent to the Times concerning these errors). A question I often encounter is where does this work belong? While scientific institutions are increasingly receptive to art and artists, I have noticed that traditional art constituents—collections, galleries and collectors are not greatly interested in a medium that is difficult to categorize, commodity and exhibit. The heartening part of this practice is however that, when the concepts are clear, the general public loves this kind of art, and this genre can become a superb platform for the dissemination of scientific information. When the Hand Up Project was originally shown as part of an exhibition at the University Art Museum in Berkeley, CA, I would go every day to check on the crabs. And I discovered that the lion’s share of the visitors, in the entire museum, could be found crowded around the hermit crab enclosure, watching the animal’s behavior and considering the new needs of this natural life form. To the Editor: I am pleased that the Science Times chose to dedicate a quarter page to “Corpor Esurit, or we all deserve a break today” (8/24/10), an art piece that I created in consultation with the respected animal behaviorist Dr. Chris Johnson, and several zoological institutions that keep ants. However, the review was incorrect regarding the species of ant in the exhibition and neglected a few important details. Pogonomyrmex occidentalis, the species of ant that is actually housed in the exhibition, is also a harvester ant and, like the Pogonomyrmex barbatus—the species discussed in the article, it is an ant of choice for commercial ant farms, where it typically reside without a queen or brood. Pogonomyrmex occidentalis was not chosen at random but selected after careful consideration of its diurnal activity, foraging distance and nesting behavior, and of the wide array of seed foods and non-seed proteins it consumes. The exhibit itself was funded by a grant from the Center for Exploratory and Perceptual Arts in Buffalo, and was built at eye height to facilitate first-hand observation of an animal that is rarely seen at an intimate distance. It includes a climate-controlled nesting area and offers these animals ideal tunneling material and foraging space. Observational questionnaires filled out by visitors to the gallery indicate that the ants are actively foraging for a wide variety of food items, while handouts listing the constituents of each food choice indicate that many of them are derived from seeds such as wheat and corn. Longevity in the population was also addressed at a gallery talk that Dr. Johnson and I gave on July 11th. The average life span of Pogonomyrmex occidentalis in an ant farm is less than a month. During the course of the exhibit, the colony cleaned house by interring their deceased in specific locations at the perimeter of their foraging areas. This project is a consideration of industrial food production, the interconnected nature of our food chain, and the plight of life forms, including humans, facing changing food sources and habitats. I look forward to seeing all of these topics addressed in future sections of the Science Times. A good overview of the project can be found at the Journal of Environmental Studies and Sciences and is partially reprinted in the post below. This is my favorite piece of your work because it is so interesting. I never thought about feeding ants fast food and its awesome to see what they would and wouldn’t eat. I also like the structure of the ant farm and how there is a sky line in there. It gives the farm some excitement. If ants could talk I would be curious of what they thought about McDonald’s fast food.